John, Lord Lovell, of Titchmarsh (near Thrapston in Northamptonshire) died in 1408. 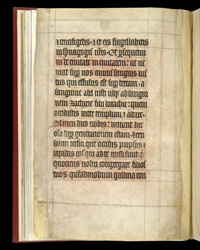 This lectionary contains a full-page miniature with an inscription stating that he commissioned it as a gift to Salisbury Cathedral, so that the canons would pray for his soul, and for that of his wife, Maud de Holand. The same miniature has the name of the artist, John Siferwas, a Dominican friar and the illuminator of the Sherborne Missal, which is also in the British Library. Siferwas was a successful artist who originated at Guildford but seems to have worked on an itinerant basis. Questions have arisen as to where the manuscript was made. It could well have been produced at Salisbury, although Glastonbury has been suggested. The Sherborne Missal is known to have been made for St Mary's Abbey, Sherborne, in Dorset, and probably was made there. Siferwas probably had been head-hunted for the project after his tour-de-force performance on the 'Lovell Lectionary'. In the miniature John is shown as an old man towards the end of his life, while to the left he stands as a youth, holding the chalice of poison which failed to kill him. The arms in the top border are those of Holy Trinity Priory, Aldgate, London, but also represent the Trinity in other less specific contexts.